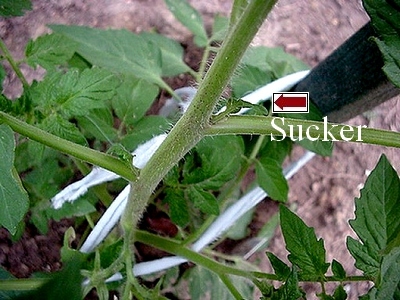 Will tomato plants produce more if you take some of the leaves off and if so which ones should come off. I have a container, patio cherry tomato plant that is about 3 foot high and growing very well, but to get the best fruit do I need to prune off some of the leaves? I'm really glad to hear your using containers for growing your tomatoes. Sounds like you're doing great! First, look for the suckers. That's the small growth that starts in between the larger stems. I make it a point to remove mine about every other day. They grow really quickly! Secondly, I always prune my plants by removing the bottom four or five stems. It has a tree resemblance by the time I'm finished pruning. That just allows, like suckering, for more of the plants nutrients to make it to the blossoms. Thus, and hopefully, there will be quicker and larger fruit. On the other hand, I know many, many gardeners who choose to do nothing to their tomato plants. And it's very safe for you to choose that method as well. Either way, you can have confidence that you'll get fruit. Just most would say a little quicker with suckering and pruning.